"Hungarian crown" redirects here. For the Polish royal regalia, see Hungarian Crown. 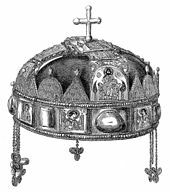 The Holy Crown of Hungary (Hungarian: Szent Korona[note 1]), also known as the Crown of Saint Stephen, was the coronation crown used by the Kingdom of Hungary for most of its existence; kings have been crowned with it since the twelfth century. The Crown was bound to the Lands of the Hungarian Crown (sometimes the Sacra Corona meant the Land, the Carpathian Basin, but it also meant the coronation body, too). No king of Hungary was regarded as having been truly legitimate without being crowned with it. In the history of Hungary, more than fifty kings were crowned with it, up to the last, Charles IV, in 1916 (the only kings who were not so crowned were John II Sigismund, Gabriel Bethlen and Joseph II). The enamels on the crown are mainly or entirely Byzantine work, presumed to have been made in Constantinople in the 1070s. 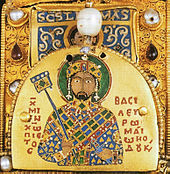 The crown was presented by the Byzantine Emperor Michael VII Doukas to King Géza I of Hungary; both are depicted and named in Greek on enamel plaques in the lower crown. It is one of the two known Byzantine crowns to survive, the other being the slightly earlier Monomachus Crown, which is also in Budapest, in the Hungarian National Museum. However, the Monomachus Crown may have had another function, and the Holy Crown has probably been remodelled, and uses elements of different origins. The date assigned to the present configuration of the Holy Crown varies, but is most commonly put around the late 12th century. The Hungarian coronation insignia consists of the Holy Crown, the sceptre, the orb, and the mantle. The orb has the coat-of-arms of Charles I of Hungary (1310–1342). In popular tradition the Holy Crown was thought to be older, dating to the time of the first King Stephen I of Hungary, crowned in 1000/1001. It was first called the Holy Crown in 1256. During the 14th century, royal power came to be represented not simply by a crown, but by just one specific object: the Holy Crown. This also meant that the Kingdom of Hungary was a special state: they were not looking for a crown to inaugurate a king, but rather, they were looking for a king for the crown; as written by Crown Guard Péter Révay. He also depicts that "the Holy Crown is for the Hungarians what the Lost Ark is for the Jewish people". The Crown’s shape is elliptic (the width is 203.9 mm, the length is 215.9 mm) and is larger than a (healthy) human head. During coronations, the king had to wear a leather 'kapa' liner, made to fit, inside the crown. The gold-silver alloys in the upper and the lower parts of the Crown differ in alloy ratio. The lower part of the Crown is asymmetric. As is the case with all European Christian crowns, it symbolizes a halo and thus signifies that the wearer rules by Divine Right. According to popular tradition, St Stephen I held up the crown before his death (in the year 1038) to offer it to the Virgin Mary to seal a divine contract between her and the divine crown. After this, Mary was depicted not only as patrona (patron saint) for the Kingdom of Hungary but also as regina (i.e. "queen"). 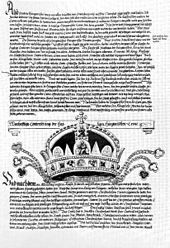 This contract was supposed to empower the crown with divine force to help the future kings of Hungary and did help reinforce the political system based on the so-called "Doctrine of the Holy Crown" (Hungarian: Szentkorona-tan). 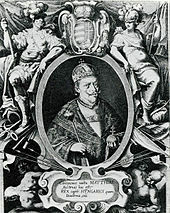 Péter Révay, a Crown Guard, expounded this doctrine in his works Commentarius De Sacra Regni Hungariae Corona (Explanation of the Holy Crown of the Kingdom of Hungary, published in Augsburg, 1613) and De monarchia et Sacra Corona Regni Hungariae (About the Monarchy and the Holy Crown of Hungary, Frankfurt, 1659). At the core of this doctrine was the notion that the crown itself had personhood and as a legal entity is identical to the state of Hungary. It is superior to the ruling monarch, who rules "in the name of the crown". 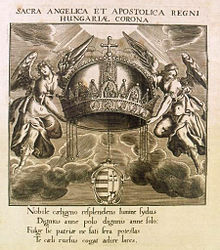 According to the most accepted theory, which is represented in the publications of the Hungarian Academy of Sciences and also of the Hungarian Catholic Episcopal Conference, the Holy Crown of Hungary consists of two main parts: "abroncs" (rim, hoop) the corona graeca, and "keresztpántok" (cross straps) the corona latina. It was created during the reign of Béla III under Byzantine influence. (The Hungarian king Béla III was brought up in the Byzantine court and was for a period the official heir to the throne there.) The crowning of Stephen I, the first king of Hungary, who was later canonized Saint Stephen, marks the beginning of Hungarian statehood. The date is variously given as Christmas 1000 or 1 January 1001. One version of the origin of the crown is written by bishop Hartvik (between 1095–1116), in which the "Pope" has sent King Stephen I "his blessings and a crown". The basis for this belief is a biography by bishop Hartvik written around 1100-1110 at the request of King Könyves Kálmán. According to "Hartvik’s legend", St Stephen sent Archbishop Astrik of Esztergom to Rome to ask for or require (both are possible from original Latin script) a crown from the "Pope", but it does not tell the name of the Pope. No matter how much Astrik hurried, the Polish prince, Mieszko I's envoy was quicker, and the crown was prepared for the future Polish king. The Pope had seen a dream during the night, seeing the angel of the Lord telling him there will be another envoy from another nation, asking for a crown for their own king. The angel told the Pope: "There will be another envoy from an unknown folk, who will ask for [or require] a crown, too, please give the crown to them, as they deserve it". The next day Astrik approached the Pope so he gave the crown to him. "Hartvik’s legend" appeared in the liturgical books and breviaries in Hungary around 1200, recalling the then-existing Pope, Pope Sylvester II. Consequently, the story of how the crown had been sent by Pope Sylvester II spread throughout the Christian world, so in 1613, crown guard Péter Révay states that the entire crown was given to St Stephen by Pope Sylvester II. However, this legend can be considered a myth, as Mieszko I was not living at the same time as either St. Stephen I or Pope Sylvester II. Also, in the "Greater Legend" of St Stephen, written around the time he was canonised (1083), we learn only that "in the fifth year after the death of his father (...) they brought a Papal letter of blessings (...) and the Lord’s favoured one, Stephen, was chosen to be king, and was anointed with oil and fortunately crowned with the diadem of royal honour". This legend clearly lacks the information that the crown was from Rome. Moreover, there are no documents found in Vatican City on the granting of the crown, even though the Vatican has a clear interest in handing over the crown from Rome, as it is representing dominance over the Kingdom of Hungary. There is another version on the origin of Holy Crown, which is a popular fallacy: Thietmar von Merseburg (died in 1018) reports that Otto III of the Holy Roman Empire has consented to the coronation of St. Stephen, and the Pope is sending his blessings; so many historians argued he has also sent a crown, however, does not report on any crown, so it cannot follow any fact. Beside the two main theories – donation by the pope and creation in the time of Béla III – there exist a number of different theories of the more romantic kind, putting the origin of the crown into the far past and into Asia. The question to what extent the upper part of the Holy Crown indeed belonged to the crown of King Stephen I remained open until 1978, when the coronation insignia was returned to Hungary and a thorough examination could be carried out. The differing styles and techniques used in making the enamel pictures and the fact that the inscriptions on the diadem are in Greek and on the bands in Latin suggest that the two parts were probably made in two different periods. However, we have to note that there are no known representations of any kind in which the crown is separated: the Holy Crown is always shown as one. The Crown is a coronation crown, which should be worn only on the occasion of a coronation, and for the rest of the time two crown guards (koronaőr) guard it. Apart from this, there are only two other people who can touch it, the nádorispán (the highest secular title), who puts it onto a pillow during coronation, and the Archbishop of Esztergom (primate of Hungary, the highest ecclesiastical title), who places it on the head of the king. The Holy Crown was made of gold and decorated with nineteen enamel "pantokrator" picture (pantokrator is a Greek word meaning "the master of the universe") as well as semi-precious stones, genuine pearls, and almandine. It has three parts: "abroncs" (rim, hoop) (corona graeca), "keresztpántok" (cross straps) (corona latina), and the cross on the top, which is today crooked. There are four hanging pendants (pendilia) dangling from chains on each side of the diadem and one in the back. The "abroncs" (rim, hoop) corona graeca ("Greek Crown") is 5.2 cm wide with a diameter of 20.5 cm. The two aquamarine stones with cut surfaces on the back of the diadem were added as replacements by King Matthias II (1608–1619). The enamel picture on the front depicts Christ Pantokrator. On the rim to the right and left of Jesus are pictures of the archangels Michael and Gabriel, followed by half-length images of the Saints George and Demetrius, and Cosmas and Damian. In the arched frame on the back of the diadem Emperor Michael VII Doukas (1071–1078) is depicted. Below it to the left is the half-length picture of "Kon. Porphyrogennetos", this probably being either Emperor Michael’s brother and co-emperor Konstantios Doukas or of his son and heir Constantine Doukas, both having been born in the purple. To the right there is a picture of the Hungarian King Géza I (1074–1077), with the Greek inscription: "ΓΕΩΒΙΤΖΑϹ ΠΙΣΤΟϹ ΚΡΑΛΗϹ ΤΟΥΡΚΙΑϹ" (Geōbitzas pistós králēs Tourkías, meaning "Géza I, faithful kralj of the land of the Turks"). The contemporary Byzantine name for the Hungarians was "Turks", while the Hungarian branch of the Greek Orthodox Church, under Constantinople's jurisdiction, was named the "Metropolitanate of Tourkia" (Hungary), and the head of this church was the "Metropolitan of Tourkia" (Hungary). As was customary in the hierarchy of the Byzantine state, clear differentiation is made between style of the emperors and that of the Hungarian king by using a hellenized form of the common South Slavic word for "king" (Kralj) for Géza. The saints and the Greek rulers have halos while Géza does not. The inscriptions of the emperors’ names are in red, while the Hungarian king’s is in dark blue or black. The enamel plaques on the circular band, the panel depicting Christ Pantokrator, and the picture of Emperor Michael were all affixed to the crown using different techniques. The picture of the emperor could not be attached to the rim in the same way as the Pantokrator picture on the front. The frame was folded upwards and the picture of the emperor was nailed to the edge. We can thus conclude that the picture of Michael VII was not originally designed for this crown, but was probably used first somewhere else. The corona graeca with its pointed and arched plaques is identical to the form of the crowns of the Byzantine empresses[note 2] – in other words it was a woman’s crown. It was given by Emperor Michael Dukas VII to King Géza’s wife, known only as Synadene, around 1075. The gift was not a new crown, but rather an old crown designed for a woman that had to be selected from the Emperor’s treasury and remodelled. The enamel pictures that become outdated were removed, since either represented earlier historical figures or were not appropriate for the Hungarian queen according to court protocol. It was in this form that the crown was sent to Hungary. There is another view that the Géza depicted on the corona graeca is not King Géza I but St Stephen's father. This view is confirmed by the fact that Grand Prince Géza is depicted on the corona gracea without a crown, although carrying a royal sceptre. The "keresztpántok" (cross straps) corona latina ("Latin Crown") is made of four 5.2-cm-wide gold strips welded to the edge of a square central panel (7.2*7.2 cm); the strips are usually assumed to have been originally made for some other object, and adapted for the crown. It is not an independent object, as it has no function alone. It was designed to be attached to the top rim of the Corona Græca and provide a dome-shaped top. The inscription on the pictures of the saints and the style of their lettering suggest the date when they were made. Amidst the antique-style capital letter, the T in Thomas and the second U in Paulus are formed in the style characteristic of the Latin letters used on Byzantine coins, a practice abandoned in the middle of the eleventh century. They may have decorated a reliquary box or a portable altar given to István I by the pope, or possibly the treasure binding of a book. It is also possible, although cannot be verified, that István I received a crown as a gift from one of the popes, reciprocating his – historically documented - gifts. The picture of the apostles, however, based on their style, cannot be dated to around 1000. The intersecting bands are edged with beaded gold wire that closes off the lower end of the bands and finishes off the system of decoration. There are twelve pearls on the central panel and a total of seventy-two altogether on the Corona Latina, symbolising the number of Christ’s disciples,. (Acts 10.1). The central panel is decorated with a square cloisonné enamel picture depicting Christ Pantokrator. Each band has two (altogether eight) pictures of standing apostles identical to the first eight listed in Acts 1.13. 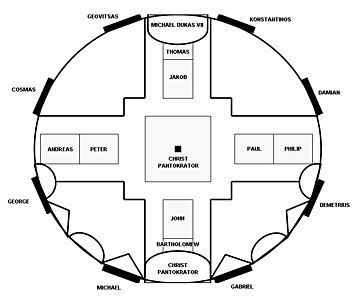 Éva Kovács and Zsuzsa Lovag suggest that the corona latina was originally a large Byzantine liturgical asterisk from a Greek monastery in Hungary. In order to get it to fit into it new role the apostles at the bottom of each of the four arms of this asterisk were cut off before it was very crudely attached to the inside of the corona graeca to transform this Byzantine open crown into a closed crown (i.e., the type of crown proper to the Autocrat, the senior emperor or monarch in Byzantine imperial protocol) and to provide a base for the reliquary cross at its summit (see Cross). The cross is attached to the crown in a rough manner, rising from the midriff of Christ in the central enamel plaque at the top of the crown. This addition might have taken place during the 16th century. The cross was knocked crooked in the 17th century when the crown was damaged, possibly by the top of the iron chest housing the insignia being hastily closed without the crown having been placed in it properly. The cross has since been left in this slanted position, and is now typically depicted as such. Later, it was the Crown itself, rather than St. Stephen's cross reliquary that came to be regarded as holy through its traditional association with St. Stephen. Éva Kovács further notes in this regard the early use of the patriarchal or double-barred cross and crown in the ancient Hungarian royal coat of arms. Since reliquary crosses frequently take such a double-barred form, the use of a patriarchal cross in the royal arms would be a direct reference to and representation of this royal relic. This association between the crown and this royal relic would also help to substantiate the theory that the Holy Crown was always intended to serve its historical role of legitimatizing the position of its wearer as the true divinely appointed king of Hungary. 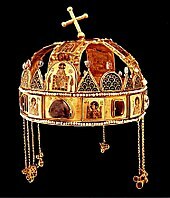 The form of the Holy Crown is identical to that of the kamelaukion-type crowns with closed tops introduced in the Byzantine Empire. 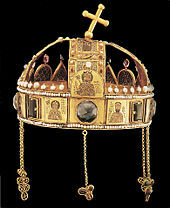 The use of many pictures is also typical of Byzantine crowns. When the intersecting bands were added to the corona graeca during the rule of Béla III, who had been brought up in Constantinople, the bands were decorated just as the corona graeca was, perhaps with the intention of imitating the Byzantine crowns. Beside the using of the intersecting bands of the corona latina, which probably came from the treasury of St. István, at the time of the creation of the crown there existed further expectation that the coronation insignia would eventually include additional gold works that could be linked to the first, beatified Hungarian king, István. The inscription embroidered onto the coronation mantle indicates with all certainty that István I and Queen Gizella had it made in 1031. The coronation sceptre with the orb at the end can also be dated to the time of St István. On the seals of Henry II, Holy Roman Emperor, and Rudolph III of Burgundy, the rulers are holding identically shaped sceptres. Such short-staffed sceptres ending in orbs were not in use as insignia earlier or later. After the fall of Communism, the crown was reincorporated into the national coat of arms in 1990, the National Assembly choosing the pre-war coat of arms in preference to the crown-less Kossuth arms of 1849. King Charles IV, taking his coronation oath at Holy Trinity Column outside Matthias Church (1916). To date, he is the last monarch to be crowned with St. Stephen's Crown. 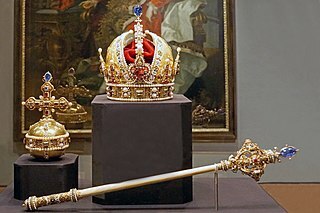 Notice the size difference between the crown and the king's head. The Holy Crown has had a lively history, having been stolen, hidden, lost, recovered, and taken abroad many times. During the Árpád dynasty (1000–1301), the coronation insignia were kept in the coronation city of Székesfehérvár. Later, the crown was housed in one of three locations: Visegrád (in Pest county); Pozsony (present-day Bratislava, Slovakia); or Buda. In 1805–1806 the Crown was kept for about three months in the castle at Munkács (now Mukachevo, Ukraine). 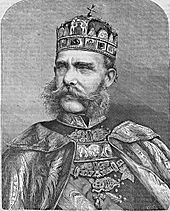 Lajos Kossuth took the crown and the coronation jewels with him after the collapse of the Hungarian Revolution of 1848 and buried them in a wooden box in a willow forest, near Orşova in Transylvania (Romania). They were subsequently dug up and returned to the royal castle in Buda in 1853. At the end of the Second World War the crown jewels were recovered in Mattsee, Austria, on 4 May 1945 by the U.S. 86th Infantry Division. The crown jewels were transported to Western Europe and eventually given to the United States Army by the Hungarian Crown Guard for safekeeping from the Soviet Union. For much of the Cold War the crown was held at the United States Bullion Depository (Fort Knox, Kentucky) alongside the bulk of America's gold reserves and other priceless historical items. After undergoing extensive historical research to verify the crown as genuine, it was returned to Hungary by order of U.S. President Jimmy Carter on 6 January 1978. Most current academic knowledge about Hungarian royal garments originates from this modern research. 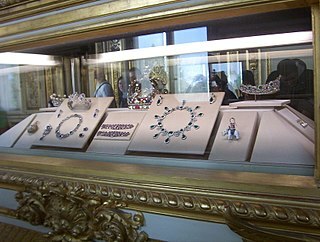 Following substantial U.S. political debate, the agreement to return the jewels contained many conditions to ensure the people of Hungary, rather than its Communist government, took possession of the jewels. Uniquely in Europe, most of the medieval ensemble of coronation regalia has survived. On 1 January 2000, the Holy Crown of Hungary was moved to the Hungarian Parliament Building from the Hungarian National Museum. The sceptre, orb and the coronation sword were also moved to the Parliament. The very large coronation mantle remains in a glass inert gas vault at the National Museum due to its delicate, faint condition. Unlike the crown and accompanying insignia, the originally red coloured mantle is considered to date back to Stephen I, and was made circa 1030. Old records describe the robe as handiwork of the queen and her sisters and the mantle's middle back bears the king's only known portrait (which shows his crown was not the currently existing one). A circular inscription sewn in Latin identifies the coat as a bishop's chasuble. The sceptre is considered the artistically most valuable piece of the Hungarian royal inventory. It contains a solid rock crystal ball decorated with engraved lions, a rare product of the 10th-century Fatimid caliphate. Its handle contains a wooden rod surrounded by very fine wrought silver ornaments. The ceremonial straight sword kept in the Holy Crown collection is a 14th-century Italian product. However, what is said to be an original coronation sword of Stephen I has been in Prague's St. Vitus Cathedral since 1368. A lance claimed to have belonged to King Stephen I, and seen in the Mantle portrait, was reportedly obtained by the Holy Roman Emperor circa 1100. ^ "De sacra corona regni Hungariae ortu, virtuti, victoria, fortuna... brevis commentarius, 1613. ^ Németh Zsolt: A magyar Szent Korona, BKL Kiadó, 2007. ^ a b Jenkins, Romilly James Heald (1967). De Administrando Imperio by Constantine VII Porphyrogenitus. Corpus fontium historiae Byzantinae (New, revised ed.). Washington, D.C.: Dumbarton Oaks Center for Byzantine Studies. p. 65. ISBN 0-88402-021-5. Retrieved 28 August 2013. According to Constantine Porphyrogenitus, writing in his De Administrando Imperio (ca. 950 AD) "Patzinakia, the Pecheneg realm, stretches west as far as the Siret River (or even the Eastern Carpathian Mountains), and is four days distant from Tourkia (i.e. Hungary)." ^ a b c Carter Vaughn Findley (2004). The Turks in World History. Oxford University Press. p. 51. ISBN 9780195177268. ^ a b Günter Prinzing; Maciej Salamon (1999). Byzanz und Ostmitteleuropa 950–1453: Beiträge zu einer table-ronde des XIX. International Congress of Byzantine Studies, Copenhagen 1996. Otto Harrassowitz Verlag. p. 46. ISBN 978-3-447-04146-1. Retrieved 9 February 2013. ^ "Hungary: Recovery of Crown Jewels 1945". Retrieved 2008-12-17. ^ "Jimmy Carter Library: The Crown of St. Stephen". Retrieved 2016-12-12. ^ "The Hungarian Crown". Archived from the original on February 20, 2012. Retrieved 2009-08-27. ^ The sword has a walrus-tooth hilt decorated in the Mammen style, dated to the 10th century. A. Merhautová, s. v. "Schwert des heiligen Stephan", in: A. Wieczorek / H.-M. Hinz (eds. ), Europas Mitte um 1000 (exhibition catalogue, Stuttgart 2000), p. 535 Nr. 27.01.09. Mechthild Schulze-Dörrlamm, "Schwerter des 10. Jahrhunderts als Herrschaftszeichen der Ottonen", Jahrbuch des Römisch-Germanischen Zentralmuseums 59 (2012) 609–651 (p. 630). Benda K.-Fügedi E. Tausend Jahre Stephanskrone, Budapest 1988. Deér J., "Die Heilige Krone Ungarnsin", in Denkschriften der Österreichsischen akademie d. Wiss. Phil.hist. Kl, 91, Vienna 1966. Fügedi E., "Medieval Coronations in Hungary in Studies" in Mediaeval and Renaissance History 3, 1981. Kovács É.-Lovag Zs., Die Ungarischen Krönungsingien, Budapest 1980. Tóth E., Szelényi K., Die heilige Krone von Ungarn, Budapest 2000. Tóth E., A koronázási palást és jogar (The Coronational Cloak and Sceptre), Szeged 2000. Tóth E. "Das ungarische Krönungspectrum", in Folia Archaeologia 47, 2000. Vajay Sz. "De Corona Regia. Corona. Regni, Sacra Corona: Königskronen und Kronensymbolik in mittelalterlichen Ungarn", in Ungarn Jahrbuch 7, 1976m pp. 37–64. Hilsdale, Cecily J. (2008). "The Social Life of the Byzantine Gift: The Royal Crown of Hungary Re-Invented" (PDF). Art History. 31 (5): 602–631. doi:10.1111/j.1467-8365.2008.00634.x. Archived (PDF) from the original on 7 April 2016. Kelleher, Patrick J. (1951). 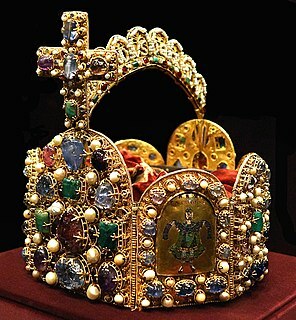 The Holy Crown of Hungary, Rome. American Academy in Rome. OCLC 603872168. Wikimedia Commons has media related to Holy Crown of Hungary. Géza I was King of Hungary from 1074 until his death. He was the eldest son of King Béla I. His baptismal name was Magnus. 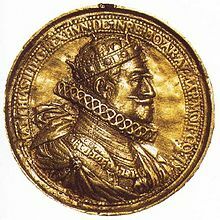 With German assistance, Géza's cousin Solomon acquired the crown when his father died in 1063, forcing Géza to leave Hungary. Géza returned with Polish reinforcements and signed a treaty with Solomon in early 1064. In the treaty, Géza and his brother, Ladislaus acknowledged the rule of Solomon, who granted them their father's former duchy, which encompassed one-third of the Kingdom of Hungary. Béla III was King of Hungary and Croatia between 1172 and 1196. He was the second son of King Géza II and Géza's wife, Euphrosyne of Kiev. Around 1161, Euphrosyne granted Béla a duchy, which included Croatia, central Dalmatia and possibly Sirmium. 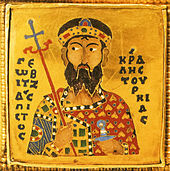 In accordance with a peace treaty between his elder brother, Stephen III, who succeeded their father in 1162, and the Byzantine Emperor Manuel I Komnenos, Béla moved to Constantinople in 1163. He was renamed to Alexios, and the emperor granted him the newly created senior court title of despotes. He was betrothed to the Emperor's daughter, Maria. Béla's patrimony caused armed conflicts between the Byzantine Empire and the Kingdom of Hungary between 1164 and 1167, because Stephen III attempted to hinder the Byzantines from taking control of Croatia, Dalmatia and Sirmium. Béla-Alexios, who was designated as Emperor Manuel's heir in 1165, took part in three Byzantine campaigns against Hungary. His betrothal to the emperor's daughter was dissolved after her brother, Alexios, was born in 1169. The emperor deprived Béla of his high title, granting him the inferior rank of kaisar. The Monomachus Crown is a piece of engraved Byzantine goldwork, decorated with cloisonné enamel, in the Hungarian National Museum in Budapest, Hungary. It consists of seven gold plates depicting Byzantine Emperor Constantine IX Monomachus, his wife Zoe, her sister Theodora, two dancers and two allegorical figures. The piece has puzzling aspects that have long made it the subject of scholarly debate; it was probably made in Constantinople in 1042. The craft of cloisonné enameling is a metal and glass-working tradition practiced in the Byzantine Empire from the 6th to the 12th century. The Byzantines perfected an intricate form of vitreous enameling, allowing the illustration of small, detailed, iconographic portraits.